The Xbox One Stereo Headset provides a premium audio and chat experience that lets you control audio without taking your hands off the controller. Note Controllers connected to a PC via Bluetooth do not support Xbox headsets. If you're connected to your PC via Bluetooth, connect your headset directly to your PC. See below for supported scenarios. 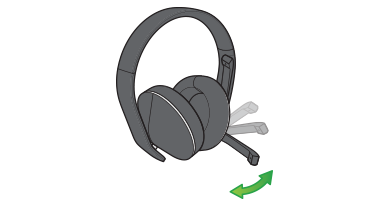 Follow these steps to ready your Xbox One Stereo Headset for use with your console. Note To use the Xbox One Stereo Headset on another device, such as a Windows phone, just plug the headset’s 3.5-mm cable into a device that has a 3.5-mm audio jack. 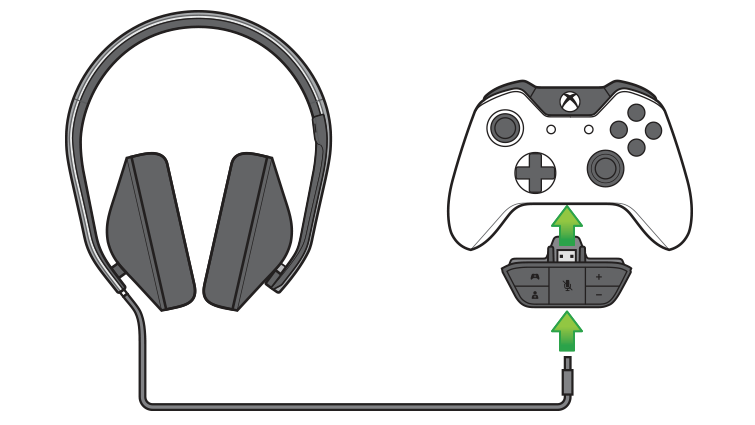 Follow the steps at Update your Xbox One Controller to use the Stereo Headset Adapter to make sure your controller is ready to work with the Stereo Headset Adapter. To install the Xbox One Stereo Headset, first insert the Stereo Headset Adapter into the rectangular expansion port on the bottom of the controller. Then, insert the 3.5-mm audio plug attached to the Stereo Headset into the bottom of the Headset Adapter. Adjust the fit of the Stereo Headset. You can adjust the size by moving each side of the headset to the left or right. Each side adjusts about 1.5 inches, which should accommodate most head sizes. Don’t force the headset to adjust farther than that, or the headset could break. Adjust the position of the chat microphone. Gently pull up or down on the microphone boom on the left ear piece arm until the microphone is in front of your mouth. You can also adjust the microphone in and out slightly so it’s the optimal distance from your mouth. This section describes how to use the buttons on the Xbox One Stereo Adapter to control your Stereo Headset. 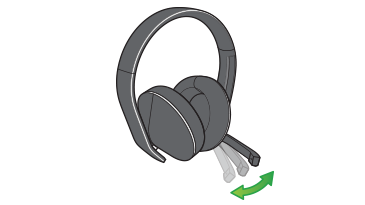 Game/Chat balance: The two buttons on the left side of the Stereo Headset Adapter adjust the mix of game audio versus chat audio. At default, the mix is 50/50, but you can adjust it to anywhere from 100/0 to 0/100. For example, if you want more game volume than chat volume, press the top button with the controller icon until you reach the level you want. A tone will sound when you have reached 100 percent. To increase the chat volume, press the bottom button with the person icon on the left side of the Stereo Headset Adapter. When you plug a compatible headset into your Xbox One Wireless controller, chat audio through Kinect is automatically muted. Mute: This (central) button mutes your chat audio so other users can’t hear you. It doesn’t mute game/music/app audio. This button has an orange LED to indicate when you are muted. The LED lights up only if a headset is plugged into the adapter. Volume: The volume up and down buttons (on the right) control all audio coming to your headset, including game and chat audio. If you don’t want to increase both game and chat audio at the same rate, adjust the game/chat audio balance. If you have a question or problem using the Xbox One Stereo Headset, see the following topics. Have you updated your controller’s software to support the Stereo Headset Adapter? Make sure your controller has fresh batteries. When the batteries get weak, some controller functions, such as audio and rumble, are turned off to conserve the remaining power. Make sure your Headset Adapter is firmly plugged into your controller and that your Stereo Headset’s 3.5-mm cable is securely plugged into the Headset Adapter. You will know it’s plugged in properly if you press the mute button and the LED lights up. 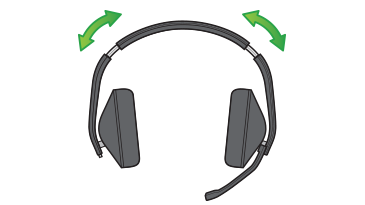 Try your Xbox One Stereo Headset with another device, such as a laptop, to see if the headset is working. If not, the headset will need to be replaced. To order a replacement, go to the Xbox Online Service Center . Try your Stereo Headset and Stereo Headset Adapter on another controller, if you can. If the headset works on the second controller, try updating the first controller again. If that fails, the controller will need to be replaced. To order a replacement, go to the Xbox Online Service Center . If you have both game and chat audio plugged into the adapter, use the Game balance or Chat balance button to get more of the desired audio type. Can I have chat through my Kinect as well as my headset? No. When a headset is detected, the console assumes you want that audio to be private and automatically turns off Kinect chat audio. The Stereo Headset Adapter doesn’t know if you’re using your headset just for chat or for all audio, so TV audio is not automatically muted when you’re using the adapter. You must manually adjust your TV audio volume. If your Xbox One Stereo Headset is broken, it should be replaced. To order a replacement, go to the Xbox Online Service Center. Repair or warranty questions? See Xbox One repair: Frequently asked questions. Would you like to contact Support regarding the "Set up and troubleshoot your Xbox One Stereo Headset" issue you were reading about or a different issue?